Pattern Sizing: I made View A in a Size T.
Were the instructions easy to follow? Yes. I followed the pictures mostly, and read the print instructions when I needed clarification. I used Sandra Betzina’s tutorial for inserting a zipper in a fly front. Her video was good, but her instructions have you insert the zipper on the left, which I guess is common for slacks. So I reversed her instructions to put my zipper on the right. What did you particularly like or dislike about the pattern? I like that the pattern is made for stretch demin. They look very ready to wear. Even thought I made a size T, I still feel like they are a bit snug in the thigh and the across hips. I figured they just need breaking in, so I wore them practically all day and even danced in them. By the evening, they had loosened up and felt more comfortable. I’m sure after a few more wears and a few more washings, they’ll be perfect. Fabric used: Stretch demin (4% lycra) from Fabric.com. I prewashed the denim twice for shrinkage and to remove excess dye. I still had some dye come off on my fingers though. 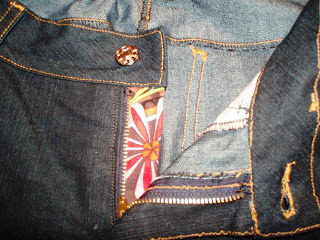 Pattern alterations or any design changes you made: I did make a 1″ dart in the center back of the waistband to eliminate “gaposis.” It worked great. The waistband fits along the conture on my waist perfectly with no gaps or gapes, something I’m rarely able to find in RTW jeans. Also, I added a coin pocket. EDITED TO ADD: I copied my back pockets from a pair of RTW jeans. Would you sew it again? Would you recommend it to others? I’d like to make the regular rise jeans sometime in the future. I would most definitely recommend this pattern to anyone who wants to try jeans. I think the pattern fits the curves of a woman’s body, so you’ll get a very nice silhouette. Just make sure you go by hip measurement. I probably could go up a size in the hips, but I think a couple of wears will help me break them in. Conclusion This is my third time making jeans. My first pair was a disasterous McCall’s 5142. They looked okay, but the denim did not have enough stretch and the crotch depth was off. The second pair I made was this Jalie pattern. They looked cute, but were a size R–too small. So the third time’s the charm, and I was finally able to construct some wearable jeans. I’m pretty pleased with the way they came out, and will wear them a lot! Love your jeans, great sewing job. I just order this pattern, cant wait to get started sewing. I love these..they look wonderful! Very flattering. Amazing job, the jeans (and you!) look fantastic! Damn! You are looking hot in those jeans – they could not be any more flattering! Hi, Rachel, I don't remember if the pattern tells you where to topstitch, but typically you topstitch 1/8" from the edge (edgestitch) and 1/4" away from the edgestitching. Or you can use a blind hem foot to edgestitch, which has a guide that follows along the edge of the fabric. 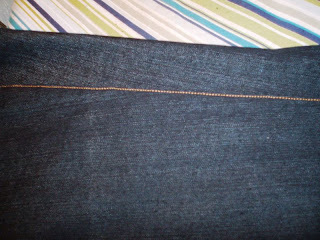 This distance of stitch with a blind hem foot is a little narrower than 1/8". 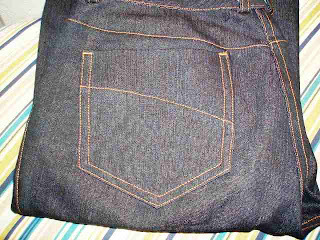 About those McCall's 5142 jeans–it was a little bit of both, but I say skip them. I think the pattern itself is just not that great. 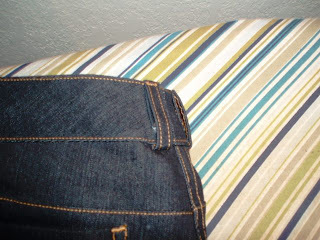 I added a link to my review of those jeans. 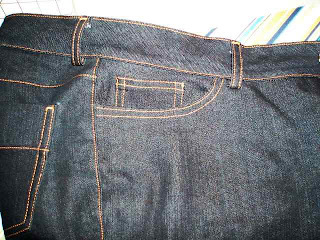 The Jalie jeans just seem to fit my shape better, and if I widen them slightly in the hips, they should be perfect. GIRL you did such a good job on those jeans! You are working them jean Girl! Wow! They turned out great and look like they fit really well! I have the pattern and finally bought some denim from fabric. com. Hope to make them up sometime this winter (too many other project for the near future on my plate). Glad to see them sewn up! I reckon that you've got the knack. Great jeans. I've got that McCalls pattern but haven't used it. Is it the pattern or just a personal fitting issue? Those look fabulous!!!! Does the Jalie pattern explain where to topstitch?